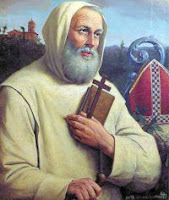 To all my friends of Germanic heritage, don't forget dear St. Bruno! Highly educated, Bruno taught theology. One of his students later became Pope Urban II. He routinely challenged the worldliness of other clergy. Following a vision he received, he retired to a mountain where he founded the first house of the Carthusian Order. While there he wrote a number of scriptural commentaries. A little bird must have told you we were needing to look into St. Bruno today. My girlfriend had her first son this morning. Naturally, the kids were all talking about which feast day it is. (Don't you just love when they live that faith?!) Then, I came across this info. Thank you for putting it up there because in all honesty, I had 10 little ones sleeping under our roof last night and I'm was way too tired to look into St. Bruno.